Android is fortunate to have an incredibly rich ecosystem of SDKs and libraries to help developers build great apps more efficiently. These SDKs can range from developer tools that simplify complicated feature development to end-to-end services such as analytics, attribution, engagement, etc. All of these tools can help Android developers reduce cost and ship products faster. 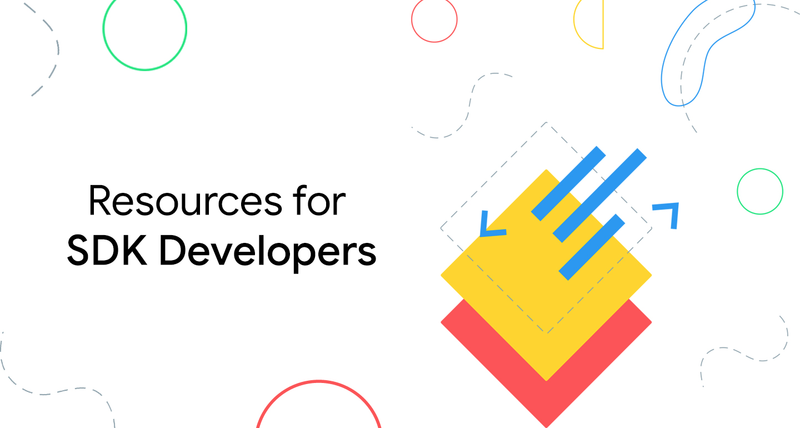 For the past few months, various teams at Google have been working together on new initiatives to expand the resources and support we offer for the developers of these tools. Today, SDK developers can sign up and register their SDK with us to receive updates that will keep you informed about Google Play policy changes, updates to the platform, and other useful information. Our goal is to provide you with whatever you need to better serve your technical and business goals in helping your partners create better apps or games. Going forward we will be sharing further resources to help SDK developers, so stay tuned for more updates. 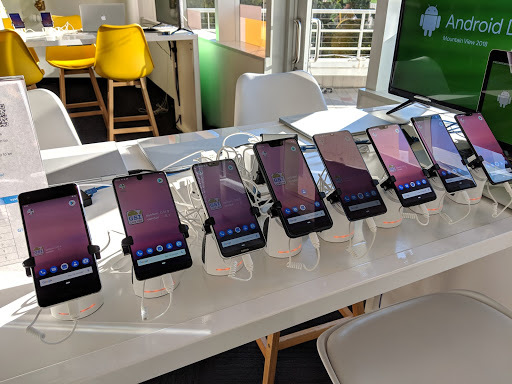 If you develop an SDK or library for Android, make sure you sign up and register your SDK to receive updates about the latest tools and information to help serve customers better. And, if you're an app developer, share this blogpost with the developers of the SDKs that you use! Today, we are launching the final API 28 emulator image for developers. This image will also contain the UI redesign we announced in August. 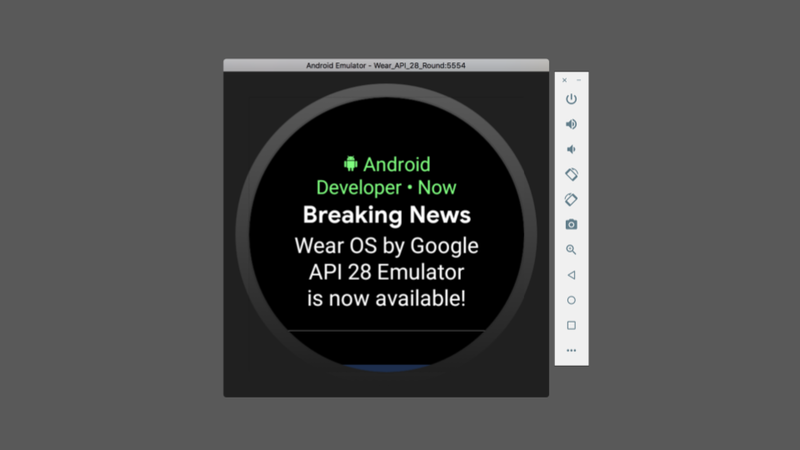 You should verify that your app's notification works well with the new notification stream, and that your apps work well against changes previously announced for API 28. What's new in API 28? New notification stream - You should make sure that your notifications are branded correctly, using color, and that the notification is sufficiently concise to fit into the new layout. Custom notification layout is no longer supported. App Standby Buckets - Wear OS prioritizes app requests for resources based on how recent and how frequently the apps have been used. Developers are advised to follow best practices to ensure that their app behaves well, whichever bucket the apps are in. User input and data privacy - To enhance user privacy, API 28 introduced new changes which limit background apps' access to device sensors. Depending on app requirements, developers may need to use a foreground service to enable continual access to sensor data. Please note that changes related to the new notification stream are being rolled out to devices supporting API 25 and up. You can test how your notification will behave now, before roll-out is complete, by using the API 28 emulator image. Just because we are now in release build does not mean that our work stops here. Please continue to submit all bug / enhancement requests via the Wear OS by Google issue tracker. Finally, we are grateful for all of your valuable feedback during the developer preview. It played an important role in our decision making process - especially concerning App Standby Buckets. Thank you! 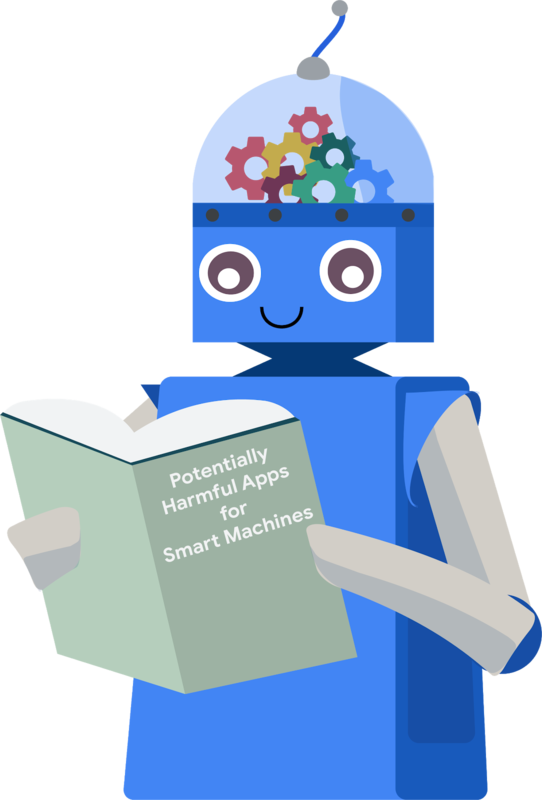 In a previous blog post, we talked about using machine learning to combat Potentially Harmful Applications (PHAs). This blog post covers how Google uses machine learning techniques to detect and classify PHAs. We'll discuss the challenges in the PHA detection space, including the scale of data, the correct identification of PHA behaviors, and the evolution of PHA families. Next, we will introduce two of the datasets that make the training and implementation of machine learning models possible, such as app analysis data and Google Play data. Finally, we will present some of the approaches we use, including logistic regression and deep neural networks. Detecting PHAs is challenging and requires a lot of resources. Our security experts need to understand how apps interact with the system and the user, analyze complex signals to find PHA behavior, and evolve their tactics to stay ahead of PHA authors. Every day, Google Play Protect (GPP) analyzes over half a million apps, which makes a lot of new data for our security experts to process. Leveraging machine learning helps us detect PHAs faster and at a larger scale. We can detect more PHAs just by adding additional computing resources. In many cases, machine learning can find PHA signals in the training data without human intervention. Sometimes, those signals are different than signals found by security experts. Machine learning can take better advantage of this data, and discover hidden relationships between signals more effectively. 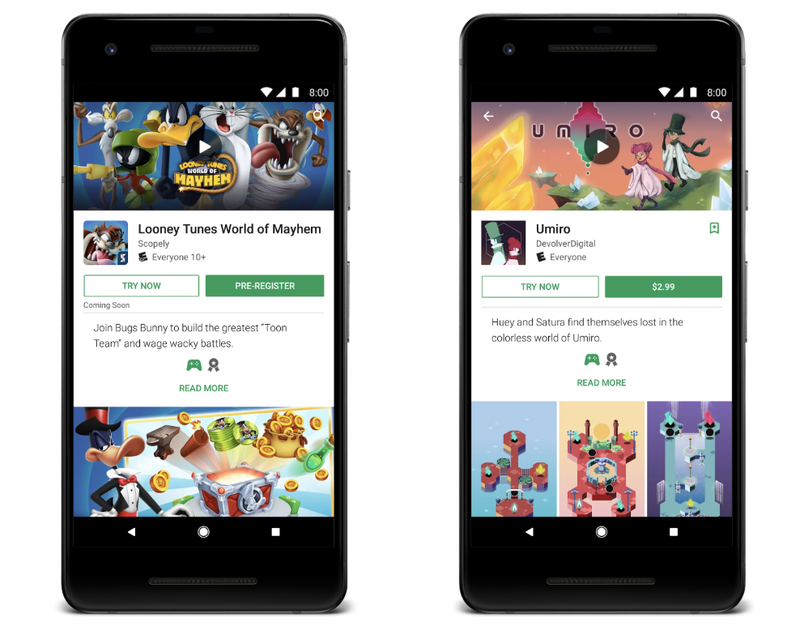 There are two major parts of Google Play Protect's machine learning protections: the data and the machine learning models. The quality and quantity of the data used to create a model are crucial to the success of the system. For the purpose of PHA detection and classification, our system mainly uses two anonymous data sources: data from analyzing apps and data from how users experience apps. Google Play Protect analyzes every app that it can find on the internet. We created a dataset by decomposing each app's APK and extracting PHA signals with deep analysis. We execute various processes on each app to find particular features and behaviors that are relevant to the PHA categories in scope (for example, SMS fraud, phishing, privilege escalation). Static analysis examines the different resources inside an APK file while dynamic analysis checks the behavior of the app when it's actually running. These two approaches complement each other. For example, dynamic analysis requires the execution of the app regardless of how obfuscated its code is (obfuscation hinders static analysis), and static analysis can help detect cloaking attempts in the code that may in practice bypass dynamic analysis-based detection. In the end, this analysis produces information about the app's characteristics, which serve as a fundamental data source for machine learning algorithms. In addition to analyzing each app, we also try to understand how users perceive that app. 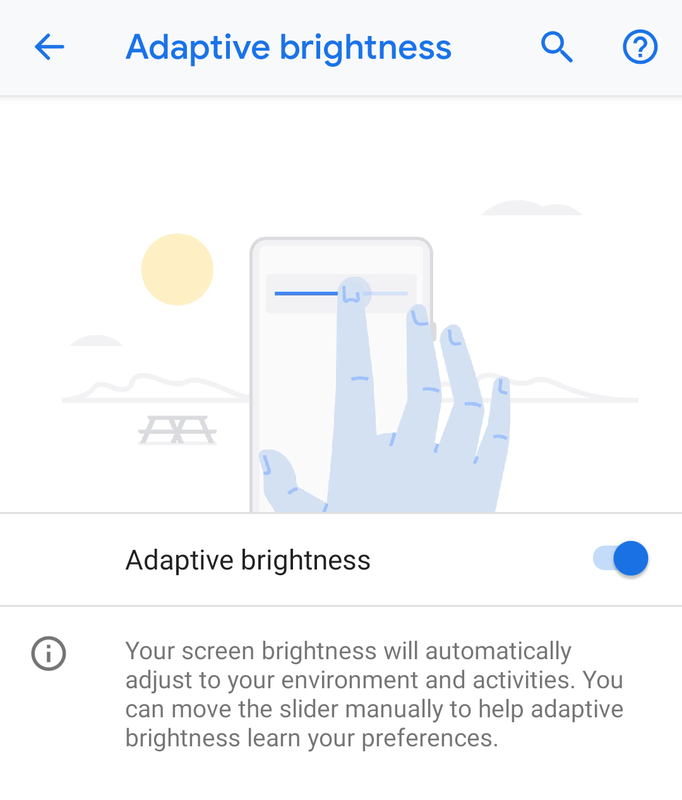 User feedback (such as the number of installs, uninstalls, user ratings, and comments) collected from Google Play can help us identify problematic apps. Similarly, information about the developer (such as the certificates they use and their history of published apps) contribute valuable knowledge that can be used to identify PHAs. All these metrics are generated when developers submit a new app (or new version of an app) and by millions of Google Play users every day. This information helps us to understand the quality, behavior, and purpose of an app so that we can identify new PHA behaviors or identify similar apps. In general, our data sources yield raw signals, which then need to be transformed into machine learning features for use by our algorithms. Some signals, such as the permissions that an app requests, have a clear semantic meaning and can be directly used. In other cases, we need to engineer our data to make new, more powerful features. For example, we can aggregate the ratings of all apps that a particular developer owns, so we can calculate a rating per developer and use it to validate future apps. We also employ several techniques to focus in on interesting data.To create compact representations for sparse data, we use embedding. To help streamline the data to make it more useful to models, we use feature selection. Depending on the target, feature selection helps us keep the most relevant signals and remove irrelevant ones. By combining our different datasets and investing in feature engineering and feature selection, we improve the quality of the data that can be fed to various types of machine learning models. Building a good machine learning model is like building a skyscraper: quality materials are important, but a great design is also essential. 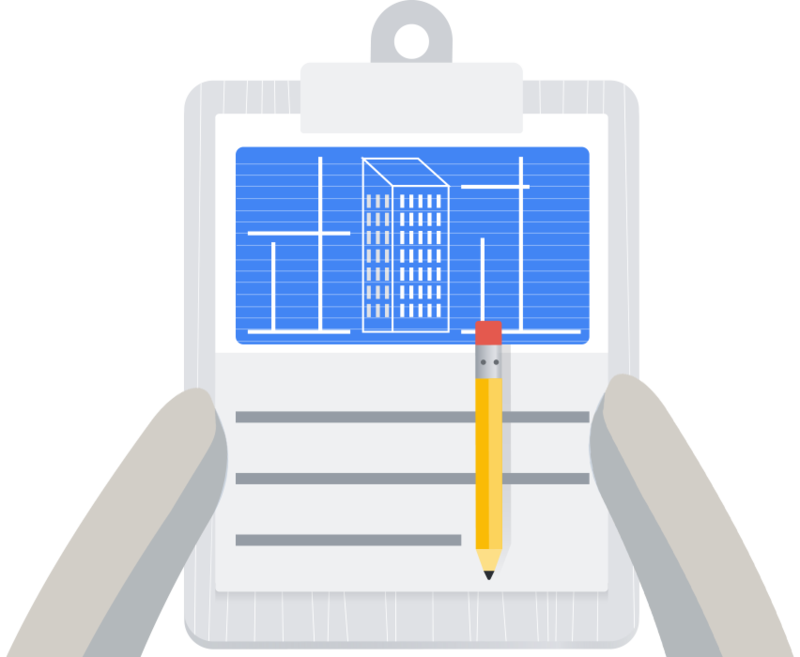 Like the materials in a skyscraper, good datasets and features are important to machine learning, but a great algorithm is essential to identify PHA behaviors effectively and efficiently. We train models to identify PHAs that belong to a specific category, such as SMS-fraud or phishing. Such categories are quite broad and contain a large number of samples given the number of PHA families that fit the definition. Alternatively, we also have models focusing on a much smaller scale, such as a family, which is composed of a group of apps that are part of the same PHA campaign and that share similar source code and behaviors. On the one hand, having a single model to tackle an entire PHA category may be attractive in terms of simplicity but precision may be an issue as the model will have to generalize the behaviors of a large number of PHAs believed to have something in common. On the other hand, developing multiple PHA models may require additional engineering efforts, but may result in better precision at the cost of reduced scope. We use a variety of modeling techniques to modify our machine learning approach, including supervised and unsupervised ones. One supervised technique we use is logistic regression, which has been widely adopted in the industry. These models have a simple structure and can be trained quickly. Logistic regression models can be analyzed to understand the importance of the different PHA and app features they are built with, allowing us to improve our feature engineering process. After a few cycles of training, evaluation, and improvement, we can launch the best models in production and monitor their performance. For more complex cases, we employ deep learning. Compared to logistic regression, deep learning is good at capturing complicated interactions between different features and extracting hidden patterns. The millions of apps in Google Play provide a rich dataset, which is advantageous to deep learning. In addition to our targeted feature engineering efforts, we experiment with many aspects of deep neural networks. For example, a deep neural network can have multiple layers and each layer has several neurons to process signals. We can experiment with the number of layers and neurons per layer to change model behaviors. We also adopt unsupervised machine learning methods. Many PHAs use similar abuse techniques and tricks, so they look almost identical to each other. 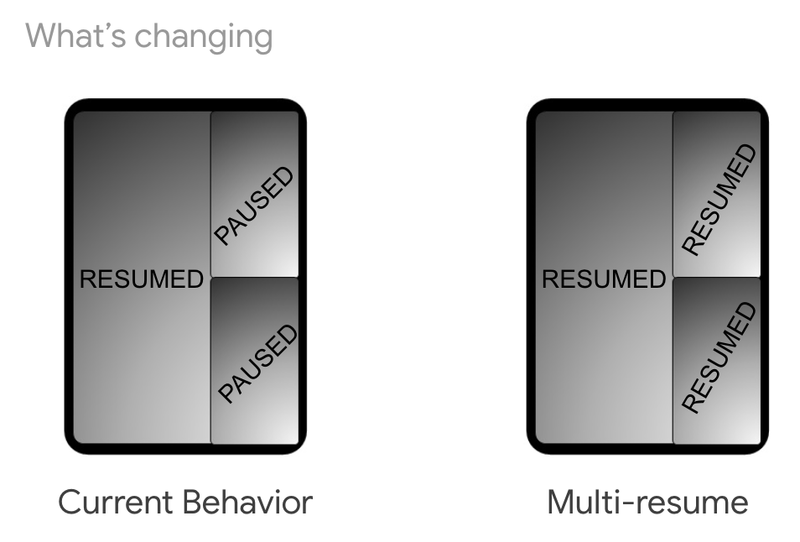 An unsupervised approach helps define clusters of apps that look or behave similarly, which allows us to mitigate and identify PHAs more effectively. We can automate the process of categorizing that type of app if we are confident in the model or can request help from a human expert to validate what the model found. PHAs are constantly evolving, so our models need constant updating and monitoring. In production, models are fed with data from recent apps, which help them stay relevant. However, new abuse techniques and behaviors need to be continuously detected and fed into our machine learning models to be able to catch new PHAs and stay on top of recent trends. This is a continuous cycle of model creation and updating that also requires tuning to ensure that the precision and coverage of the system as a whole matches our detection goals. 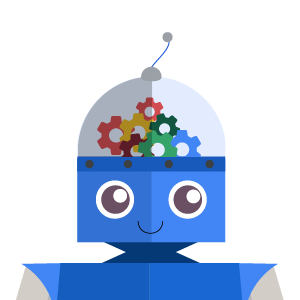 As part of Google's AI-first strategy, our work leverages many machine learning resources across the company, such as tools and infrastructures developed by Google Brain and Google Research. In 2017, our machine learning models successfully detected 60.3% of PHAs identified by Google Play Protect, covering over 2 billion Android devices. We continue to research and invest in machine learning to scale and simplify the detection of PHAs in the Android ecosystem. This work was developed in joint collaboration with Google Play Protect, Safe Browsing and Play Abuse teams with contributions from Andrew Ahn, Hrishikesh Aradhye, Daniel Bali, Hongji Bao, Yajie Hu, Arthur Kaiser, Elena Kovakina, Salvador Mandujano, Melinda Miller, Rahul Mishra, Sebastian Porst, Monirul Sharif, Sri Somanchi, Sai Deep Tetali, and Zhikun Wang. Android developers know that APK size is an important factor in user engagement. Code shrinking helps reduce the size of your APK by getting rid of unused code and resources as well as making your actual code take less space (also known as minification or obfuscation). That's why we're investing in improving code shrinking to make it faster and more efficient. 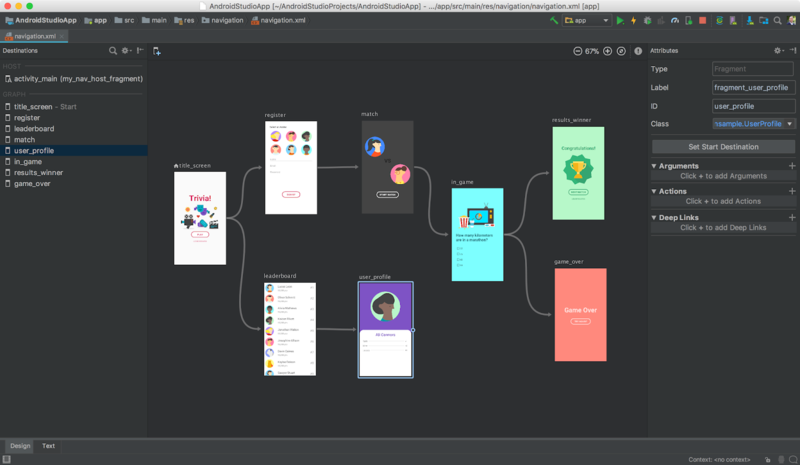 We're excited to announce that the next generation code shrinker, R8, is available for preview as part of Android Studio 3.3 beta. R8 does all of shrinking, desugaring and dexing in one step. 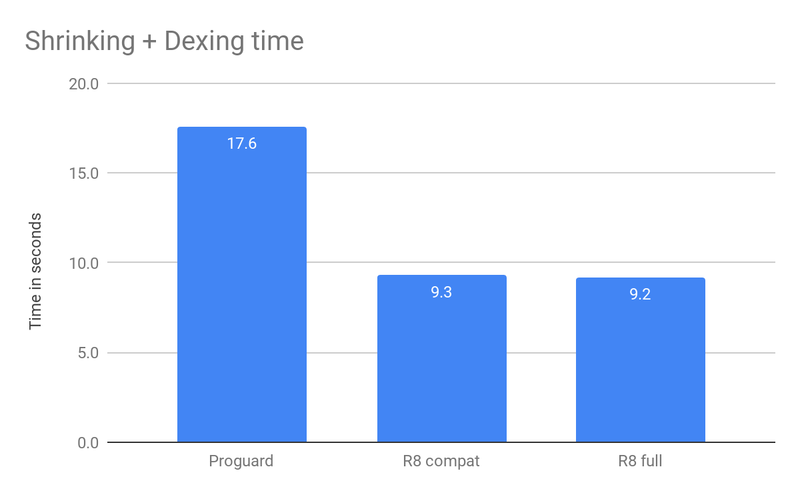 When comparing to the current code shrinking solution, Proguard, R8 shrinks the code faster while improving the output size. 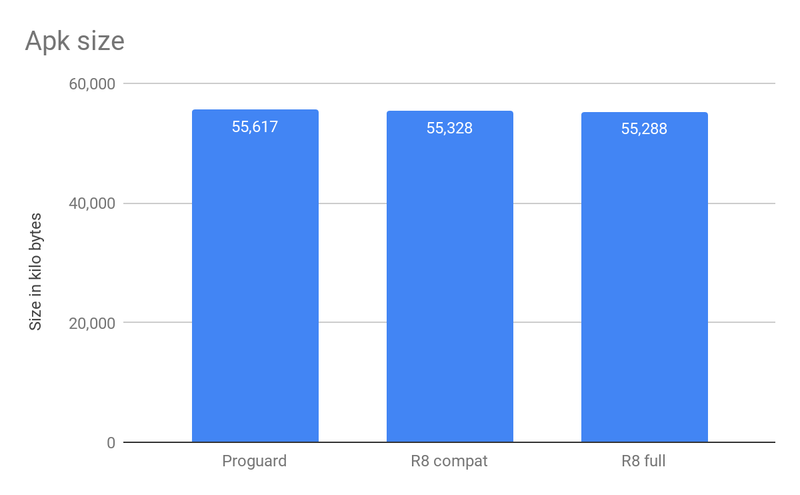 The following data comes from benchmark on the Santa Tracker app, you can find the project with benchmark details on this GitHub repository. This turns on more optimizations, that can further reduce app size. However, you might need a few extra keep rules to make it work. 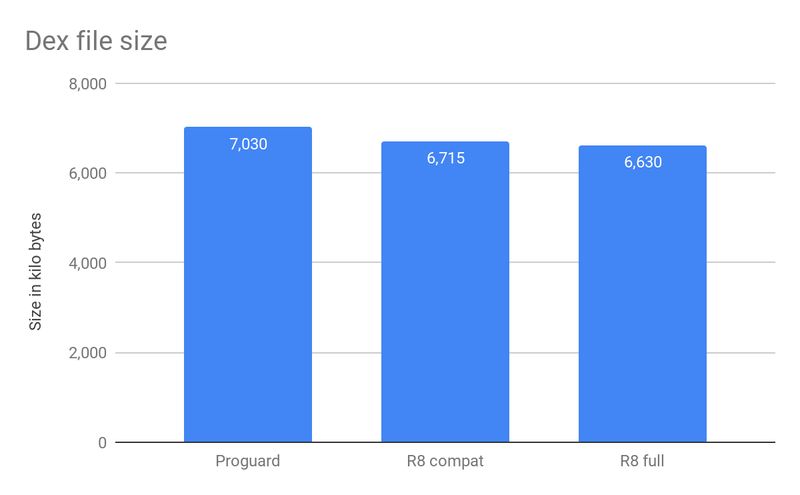 We have tested R8 correctness and performances on a number of apps and the results are promising so we plan to switch R8 as the default shrinker in Android studio soon. 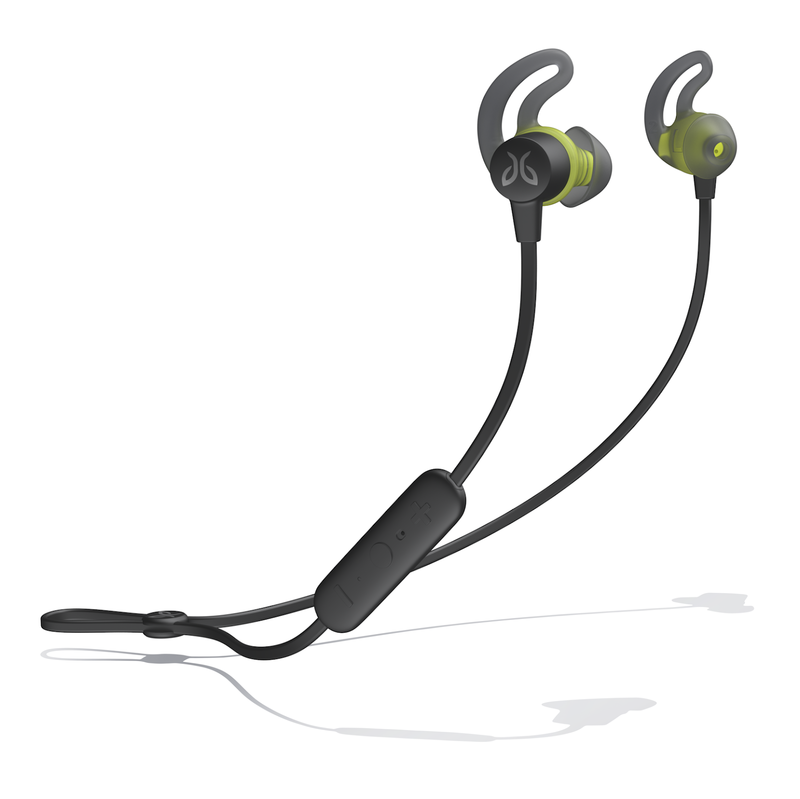 Please give R8 a try and we would love to hear your feedback. You can file a bug report using this link.